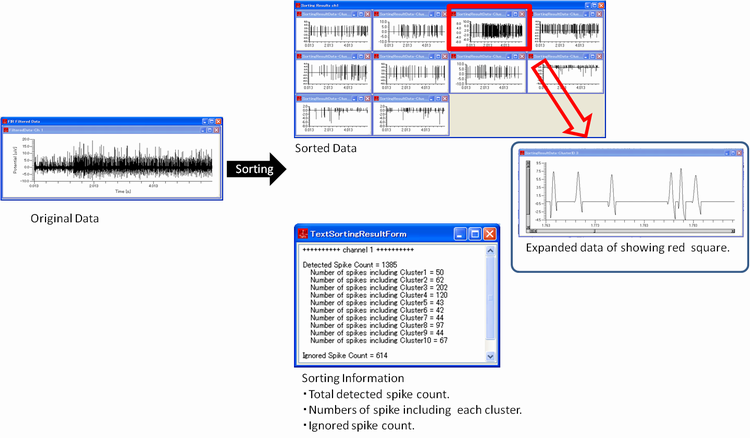 The Spike Sorting Software for multi-unit Neural Spikes. The following are the papers applying this method. SpikeTaro is now widely used, and this algorithm and software are used in international conferences and draft papers. 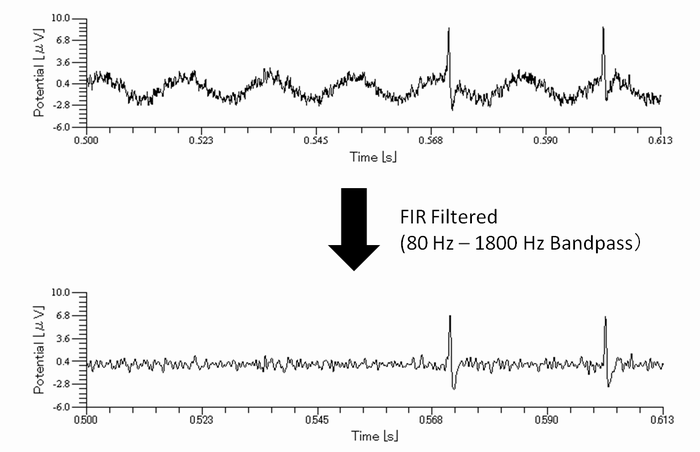 SpikeTaro comes with FIR filter (Finite Impulse Response filter). This filter is a kind of digital filter, showing liner phase property. In the "FIR Filter Setting Dialog" of SpikeTaro, user can use bandpass or highpass filters and can also set cutoff frequency(s) freely. Below is an example of bandpass (500 - 1500 Hz) filter setting and the amplitude characteristics in SpikeTaro. Signal amplitude depresses 1/10000 within spectrum of 0 - 500 Hz. Signal amplitude is the same of a input data within 500 - 1500 Hz. Signal amplitude depresses 1/1000 to 1/10000 within 1500 Hz over. Also below is an example of filtering process in SpikeTaro. In this case, the filtering result shows that the noise of power supply frequency are removed. SpikeTaro's sorting algorithm is composed of two processes below. Sorting by correlation coefficients (contribution ratio) between spike waveforms. Using peak detection algorithm, SpikeTaro detects first point of the spike of rising phase, peak point and termination point of the spike, automatically. SpikeTaro can extract single unit spike from an integrated signal of several spikes. In case of low reliability, that is, the extracted spike is too short, SpikeTaro ignores the extracted spike. In sorting process, SpikeTaro calculates correlation coefficients (contribution ratios) between all combinations of extracted spikes. Subsequently, SpikeTaro sorts spikes according with contribution ratio. User can set "contribution ratio threshold" as a sorting parameter. SpikeTaro shows better sorting performance, because SpikeTaro uses whole shape information of a spike waveform. 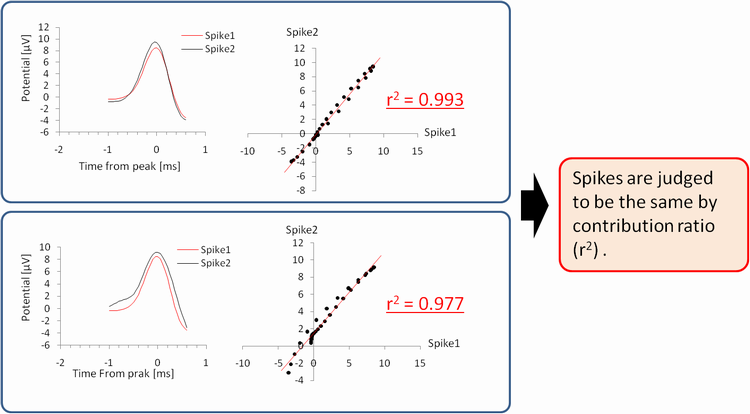 In the calculation of correlation, SpikeTaro applies natural spline interpolation to single spike waveform in order to avoid data clipping error. Below is an example of sorting results by SpikeTaro. SpikeTaro also outputs a raster plot. The horizontal axis of raster plot indicates time, and the vertical axis indicates cluster ID which corresponds to a sorted cluster. Raster plot can be used for time sequential analysis of the each spike unit. SpikeTaro also has clustering function that is independent of sorting algorithm. The clustering algorithm is Ward method indicating high classification sensitivity. 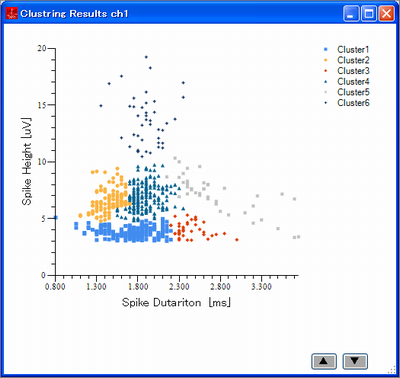 Spike heights and spike durations are used as parameters of the clustering process. 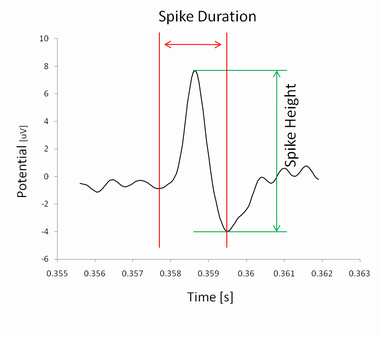 Parameters of spike height and spike duration are measured against only complete spike waveforms. 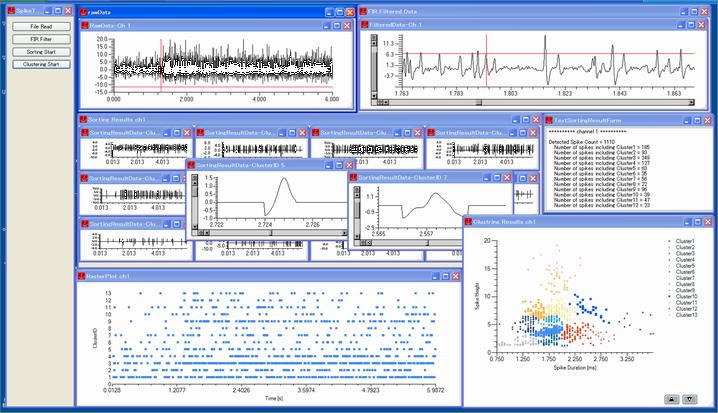 At the clustering process, SpikeTaro automatically extracts this complete spike waveforms, and applies Ward method. SpikeTaro outputs clear classification result, because the input spike waveforms to the clustering process do not include apparent error which is produced by many superimposed spike waveforms around the target spike. SpikeTaro works under the following environment. OS Type Microsoft Windows 7 (64, 32 bit), Vista (64, 32 bit), XP SP2 or later. CPU Intel(R) Core(TM)2 Duo 1 GHz or more. Others Internet connection is required for installation. (NOTE) The amount of data SpikeTaro can process is dependent on the memory amount of the environment. If a lot of memories can be used, large data can be processed. Please feel free to send e-mail to the following address to buy SpikeTaro, or to get detailed information for considering to buy. Payment is through a bank transfer. Payment after delivery is assumed for colleges, universities, and public research organizations. Prepayment before delivery is assumed for other organizations and individuals. We provide evaluation software to researchers considering to buy. Satisfy yourself before purchase for performance, accuracy and convenience of SpikeTaro. An experienced engineer with long standing research in the field of neurophysiology. Detailed achievements and attainments can be viewed in the following URL. We made this product ! Copyright(C) 2011-2018 Chinou Jouhou Shisutemu Inc. All Rights Reserved.